North Korean officials "walked away from a meeting" with Vice President Mike Pence at the Winter Olympics in Pyeongchang, South Korea, according to the vice president's chief of staff. Pence, who noticeably kept his distance from North Korean dictator Kim Jong Un's sister at the Olympics, had actually intended to meet with North Korean officials while at the games. Nick Ayers, Pence's chief of staff, confirmed in a statement to CBS News that North Korea "dangled a meeting" with Pence before cancelling. The scrapped meeting was first reported by the Washington Post. Ayers suggested the North Koreans backed out because of the administration's determination to "stand in the way of Kim's desire to whitewash their murderous regime with nice photo ops at the Olympics." "Perhaps that's why they walked away from a meeting or perhaps they were never sincere about sitting down," Ayers said. President Trump had said he would be open to talks diplomatic talks with North Korea, despite calling such an idea a waste of time in the past, according to a readout of a call he had with South Korean President Moon Jae-In earlier this month. Pence decided to take a more hardline stance against the North Korean regime, even as Moon invited Kim's sister, Kim Yo Jong, to his palace for a luncheon. Pence was still seated near the North Korean leader's sister at the opening ceremony. Pence insisted there is "no daylight" between the U.S. and South Korea when it comes to dealing with North Korea's nuclear weapons ambitions, despite their different approaches. 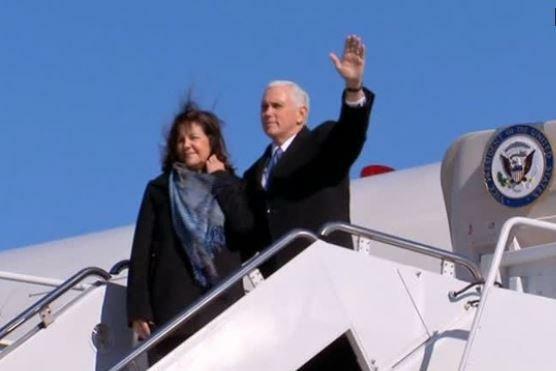 "I leave here very confident that we are going to continue to do the things we know have to be done to continue to pressure North Korea to abandon their nuclear ambitions," Pence said aboard Air Force Two on his way back to the U.S. from the Olympics. "North Korea dangled a meeting in hopes of the Vice President softening his message, which would have ceded the world stage for their propaganda during the Olympics. Instead, the vice president met with defectors who escaped tyranny, hosted Fred Warmbier whose son was essentially murdered by North Korea, pointed out their atrocious record on human rights and enslavement of hundreds of thousands of their people, spoke about their hostile plans with nuclear weapons and ballistic missiles, and announced a new round of tough economic sanctions were on the way. North Korea would have strongly preferred the vice president not use the world stage to call attention to those absolute facts or to display our strong alliance with those committed to the maximum pressure campaign. But as we've said from day one about the trip: this administration will stand in the way of Kim's desire to whitewash their murderous regime with nice photo ops at the Olympics. Perhaps that's why they walked away from a meeting or perhaps they were never sincere about sitting down." "The president made a decision that if they wanted to talk, we would deliver our uncompromising message. If they asked for a meeting, we would meet. He also made clear that until they agreed to complete denuclearization we weren't going to change any of our positions or negotiate."